Qantas has confirmed its new Perth-London nonstop flights with the Boeing 787-9 will originate in Melbourne, with a new QF9/QF10 Melbourne-Perth-London rotation replacing the airline’s existing QF9/QF10 Melbourne-Dubai-London route operated by the Airbus A380 when services begin on March 24 next year. The new Melbourne-Perth-London flights will mean a one-hour shorter travel time between Melbourne and London due to a short transit in Perth and the 787-9’s slightly faster cruising speed compared to the A380, but will also mean a significant reduction in Qantas’s capacity on the route, given the airline’s A380s seat 484 passengers, compared to 236 in the 787-9. However, alliance partner Emirates also announced on Thursday that it will operate an all-A380 schedule to Melbourne from March 24, upgrading the last of its thrice-daily flights from the Boeing 777-300ER. Qantas 787-9s will seat 42 business class passengers (in a 1-2-1 configuration), 28 in premium economy (at 2-3-2 abreast ) and 166 in economy (at nine abreast), with the 70 business and premium economy seats representing 30 per cent of the cabin, which is the highest percentage of premium seats on board any of Qantas’s widebody fleet. Indeed Qantas’s A380s seat far more passengers in economy class (371) than its 787s will carry in total. Replacing the four-class A380 with the three-class 787 on Melbourne-London also means Qantas will no longer offer first class on the route. Meanwhile the A380s currently operating Melbourne-Dubai-London will be redeployed “to meet periods of high demand from Melbourne and Sydney to destinations in Asia, such as Singapore and Hong Kong”, the airline said. Qantas says Melbourne will become the hub for its first four 787s (currently eight are on firm order), with the first two aircraft to operate the QF95/96 Melbourne-Los Angeles route six times weekly from December with the third and fourth aircraft allowing the operation of Melbourne-Perth-London. Consequently Qantas will also be able to offer a one-stop Perth-Melbourne-Los Angeles 787 service, with a 90 minute connection on the outbound (QF95) leg (although schedules show the return QF96 787 flight arriving into Melbourne at 08:25, necessitating a domestic transfer as the QF9 Melbourne-Perth flight doesn’t depart until 15:20). With tickets going on sale today Qantas has also announced pricings for the routes, with economy fares for the Melbourne-London and Perth-London routes starting from $2,270, Qantas says. Premium economy fares will start from $4,450 between Melbourne and London and from $4,250 between Perth and London, while return business fares will start from $9,890 return between Melbourne and London and from $9,725 between Perth and London. Economy fares would drop below $2,000 during sales periods, according to the airline. Qantas first announced plans to operate nonstop Perth-London flights, using an upgraded Terminal 3 on the domestic side of Perth Airport, in December 2016. “The Kangaroo Route has kept changing with new technology. It used to take four days and seven stops but now we’re able to link Australia and UK in a single hop. It’s a level of convenience Australians have never had before,” Qantas Group CEO Alan Joyce said in a statement on Thursday. “We’re conscious that this is a long flight, but not much longer than our Sydney to Dallas service. It’s the kind of route that the Dreamliner was created for, because of its built-in features to reduce jetlag and improve the overall travel experience,” Joyce said. The first scheduled nonstop flights between Australia and Europe, the Perth-London service will take approximately 17 hours, depending on winds, and at 7,829nm will be Qantas’s longest and the third longest nonstop scheduled flight in the world. Qantas chief Joyce has previously conceded the operating economics of the airline’s flights to London (it also operates the A380 on daily QF1/2 Sydney-Dubai-London services) are a “challenge”. “London is a challenge because you have over 30 carriers operating on that market and we have extremely low airfares,” Joyce told the airline’s annual general meeting in October 2016. London is Qantas’s only online destination in Europe, with the rest of the continent largely served via codeshares on its alliance partner Emirates through Dubai. Qantas also has a codeshare in place with fellow oneworld member Finnair for Helsinki, which Emirates does not serve. Once QF9/10 switches to operating via Perth, Melbourne passengers wishing to travel to Dubai, or via Dubai on one-stop flights to European destinations other than London, will still be able to book on Qantas codeshared Emirates flights. Emirates’ plans to upgrade its third daily EK408/409 Dubai-Melbourne flights from the 777-300ER to the A380 adds back 945 seats to the route, an increase of 10 per cent for the Dubai-based airline. Meanwhile, rival Gulf carrier Etihad announced on Wednesday that it is was downguaging capacity on Melbourne-Abu Dhabi, with its EY460/461 A380 flights to be operated by the 777-300ER from October 29, while from the same date the current EY462/463 rotation will see 787-9s replacing the 777-300ER. 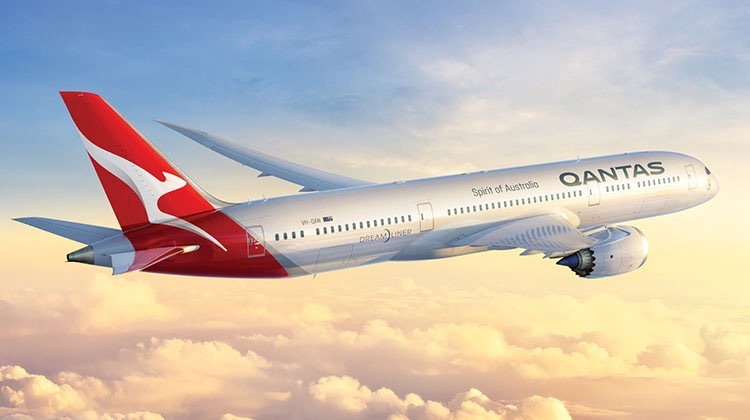 Qantas’s first 787 is due for delivery in October and will be registered VH-ZNA, Australian Aviation ‘Traffic’ columnist Gordon Reid reports in the May issue of the magazine. The advantage of the current schedule of QF9 & 10 are the arrival times. When Qantas moved the departing flight to late evening out of Melbourne, it made a great deal of sense to take advantage of a full day’s work, get to Tulla late and be in London for dinner and an early night’s sleep. The new schedule returns to the loss of most of the day in Melbourne and an excruciatingly long day in London. Well, with a new arrival time at LHR of 05.10, you be at work in The City before anybody else – and even earlier once Crossrail is fully operational! Where will the a380’s be redeployed? Return SYD – LAX to daily a380 + Hong Kong a380 daily? What was a reasonable 1 stop option (better via Singapore or Hong Kong but that aside) and replace it with such a long sector ( Perth – London ) will fail, guaranteed !!! A better solution to Europe would have been to go back to the 80s and hub through Asia KL, HK or Singapore and on to London, Amsterdam, Paris, Berlin, Rome and Athens or just get out of Europe all together………. The A380’s are going to be redeployed on MEL-SIN and MEL-HKG during periods of high demand but when demand is not as high i haven’t the slightest.Whats the demand for SYD-LAX and SYD-HKG? Economy will be 17 hours, on seats a good deal narrower than on the A380, and narrower even than on even a B747, more like those on a B737 designed for short domestic routes, not ultra long haul thanks to Mr Joyce’s going with the lowest common denominator and fitting Jetstar style 9 across in a design which originally had 8 across (and would have been a Dreamliner). Reading between the lines, the A380 might have a limited life span. Probably one of the two spare A380s will allow the cabin refurbishment to be done, the other spare unit will be used as suggested above, operating peak services to SIN and HKG. Currently the 2 A380s Daily into London from/to Dubai are not usually full, as a lot of passengers fly Qantas to/from Dubai, then Emirates to/from Dubai to their preferred destination in Europe. So perhaps 1 380 and 1 787 to London daily, more accurately matches the demand for Qantas Australia to/from London. Given Qantas have announced the 380 cabin refurbishment, I dont see the 380 having that limited a life span at Qantas! Longer term with their plans for a PER mini hub I see this as a success. I think though that they should have held on to the MEL A380 for the busy Easter Period and then dropped it end of APR. They may not have been able to secure a second midday slot to make this happen. MEL actually gets a product upgrade more suited to their premium mix. They now have much more control of the customer experience with a hub in Australia and their own terminal. The capacity reduction could be short and I can see something like CDG starting for the European summer with frames 5 and 6 and BER/FCO with frames 7 and 8. They now have an edge with PER to LAX and a consistent late evening LAX arrival for other East coast travellers. The two older 744s get retired and the network grows sustainably. Less focus on the Americas as that market cools slightly and the next batch of 789s would then be for increasing frequency to SCL and likely a MEL -DFW. Premium tourism/business markets like BME and KTA now have 1 stop access too. I was reading articles last night about the future of the A380, Emirates are about to retire 5 of the very first air frames [although these will be replaced with new] and Singapore have the first of their 10 year old units coming off lease next year. Realistically if Emirates had not bought the A.380 in the no’s they have it would have been a financial disaster. If Airbus decide not to continue the A380 program where does this leave Emirates an all other major players. The Boeing 777 X may be the savior. although obviously not with Emirates at this stage. I,ve done the LAX/SFO and back a few times in the 787.It may be a technological marvel from an engineering /aviators point of view,but for some old sap like me in cattle it is highly uncomfortable.Bring back the 747.777 was even better. So basically. Qantas A380 fleet will all be out of Sydney except for the 2 used on the MEL-LAX. “The Sydney Airline” never been truer. Can’t see Perth becoming an effective hub! The problem is the Australian public’s perception of it being miles from anywhere, and that flyingg via Perth will add time to the Journey. I agree with Deano. Singapore would make a much better hub. Fly 787s from Adelaide, Brisbane, Canberra etc thru to Europe, India, Africa and Asia. 737s from Darwin, Townsville, Broome etc. A380s from Melbourne and Sydney to London and Frankfurt or Amsterdam. Singapore worked well for many years and is popular as a transit or stopover point. Only stopped due to Emirates deal which is clearly over if Qantas are planning flights into Europe! Has Virgin considered starting a hub In Singapore? Could link with a Virgin Atlantic service or fly to London themselves. Qantas is leaving the Melbourne market wide open for others! Paul the problem though, is lets say the A380 MEL to LHR is only on average 60% full, year round, that’s an average seat count of 290. But it is being replace by an aircraft with a seat count of 236, so already less seats. On top of that there is potentially more traffic originating from Perth, plus one stop connections from Brisbane, Darwin, Adelaide, Canberra etc competing for what is already not enough seats. But there is more the flight also one stops connects Perth to LAX, far better than via Sydney, so again more competition for those 236 seats PER-MEL-PER. What would add up seat count wise is A380 MEL-PER-LHR-PER-MEL-LAX-MEL, but of course wouldn’t work as the A380 doesn’t have the range for PER-LHR. Or alternativly LHR-PER-MEL-LAX-MEL-PER on a 787 but keeping the current MEL-DXB-LHR-DXB-MEL route but operated by another 787. Or better yet A350, both the 900 and 1000 would offer better comfort and more seats compared to the 789, especially as the 789 is right on the range limit PER-LHR. And an A359ULR could possibly do PER-LAX direct too. Anil, Virgin Australia doesn’t have any partnership with Virgin Atlantic. The only commonality is they share the same name and Virgin Group (read Richard Branson) owns 51% of Virgin Atlantic and 8% of Virgin Australia.. So you won’t be seeing them connect with Virgin anywhere. And if they were to clearly with Virgin Aus’s move on HKG, that would be the place to do it. Also Qantas’s agreement with EK doesn’t prevent Qantas operating flights to Europe, though to be honest other than LHR, there are not too many locations in Europe that make sense for Qantas to operate to, even with a “small” capacity aircraft like the 787.
the connections are great for ADELAIDE people.I do remember the old QF81 when that used to operate to Singapore on the A330’S(never got to do that flight on the old 767’s) and would hear the announcement of QF9 OR QF31 OR BA 12 OR BA16 onto London leaves from whatever gate and connection times depending on which service you got from SIN TO LHR were about equal to this new PERTH nonstop to the UK service for those of us connecting onwards for us ex ADL people.you would have about a four to five hour transfer time and transit like before but it works out well if you don’t need the stopover in either direction. Great idea from Qantas. Myself and my wife have no interest in flying through the Middle East with our children to London. The Middle East is too dangerous for me and my wife to want to risk our lives and the lives of our children. I do not trust security at Middle East airports and the risk of availability of SAMs to Muslim terrorists (e.g. Russian civilian airline plane shot down by SAM originating from the Sinai a couple of years ago) is too large. The times of departure and landing at the various airports suit us. The only downside is the cost of the Premium Economy seats. If Qantas was to reduce the return cost Melb-London down to approx $3,500 this would be a very attractive flight we would wish to use on multiple occasions. Qantas going for the A350ULR could solve a number of issues. Firstly Qantas could use their purchase as a leverage of getting out of the commitment to the last 8 A380s ( because it would be a great proving ground of the type and Airbus). Secondly it’s more comfortable for passengers with a greater range than any 787, enabling new routes and combinations for Qantas. @ Anil Kattula Singapore is already a hub for Qantas with passengers transferring onto Jetstar Asia for Asian destinations or code share to European destinations. Qantas currently flies twice daily to Singapore from Sydney, daily from Melbourne and Brisbane, and daily from Perth (twice daily 4 days a week). There isn’t the demand for Qantas to fly on to many European destinations or Africa from Singapore. As for the Emirates agreement, it is not over. It remains strong. As for Virgin, Virgin Atlantic doesn’t fly to Singapore so there would be no connection if Virgin flew to Singapore. The other issue is they don’t have the aircraft to start Singapore services nor the balance sheet to increase the international fleet. @ Jack. I am sure Qantas have run the numbers and are initially starting with a single service to see what demand is like. Emirates has picked up the extra seats by changing a B777 to A380 so those not wanting to go to London still can fly via Dubai. If the demand is there, I see a possibility of two services a day using B789s. Even with the lower seat count, the Mel – Per – Lon route should be more profitable due tot he lower operating costs of the B789 v the A380. With Melb becoming the initial home of the B789, it is possible other routes out of Melb may come in to play such as DFW as additional aircraft are delivered in 2018/19 FY. It will be interesting to see how the 2 spare A380s are deployed. I will use the Perth / London connection, any thing is better than Dubai. As for spare 380 please put it on Brisbane / LA, we sat on tarmac for 2 hours with old 747. Same flight just flew over hour and half late again. Why does Qantas have to fly to London it could fly to Istanbul, Baku, Moscow,Kiev, or Tel Aviv direct from Melbourne, or Sydney, it is actually possible! I have just seen the new schedules and it’s great.Leave Adelaide lunchtime on the QF587 TO PERTH and arrive into Perth just before 2pm local time then just over 5 hours there before continue onwards to LONDON on the QF9.COMPARE this to any ASIAN CARRIER SIA,MAS with eight HOUR transit wait times in their hubs for the South Australian Market on the way over and QANTAS will be onto a winner.Inbound schedules are not too bad leave LONDON 10AM get there following day 1:15pm on the QF10 and you can get the last flight of the day QF584 onto Adelaide getting you in around 10pm or thereabouts.home in your own bed that night well before thanks to the time differences the Asian Carriers have left their hubs(SQ/MH)ONTO ADL. Just noticed the new non stop flight originates from Melbourne and not Perth. What chances have Perth people getting a flight when the plane will probably be filled with people from Melbourne? Typical lack of forward vision by Qantas and Tourism WA (who have subsidised this boondoggle by paying for part of the terminal upgrade). While I suspect the route will be popular for the premium cabins the back of the plane will prove much tougher to fill after the inevitable negative reviews for the sardine like conditions in a 9 abreast 787 for a 17 hour sector start flooding in. This is especially so when there are plenty of A380 and 9 abreast 777 alternatives (Sing and Thai for instance) through SE Asia and the ME and soon to be A350 and no doubt A330neos offering 18 inch seats. Qantas and Tourism WA would have been much better off starting a Melbourne – Perth – New Delhi route (or Mumbai / Begalaru / Chennai – take your pick). This would have at least been an unserviced route (no Indian direct flight to Perth exists) connecting the two Australian cities with the highest concentration of Indian migrants in the country with a nation seeing robust growth in its middle class and now our 9th largest source if visitors. Perth to London is a good idea with the 789, but only if you have another flight in the day from Melbourne. Otherwise they’ll be over crowded most of the time on a plane that carries half the passengers. OC, when the average person, who is looking at flying from. A to B, they don’t look at the type of aircraft they are flying in, or the seat count. To them, the type of plane they are flying in, and the seat count, is basically irrelevant. Hence, the number of low cost carriers that now fly the world skies. As such, with Qantas placing 236 seats on the 789’s, they may have hit the mark. I believe Air NZ has 301 on their 789’s. This makes the Qantas 787’s a much better way and comfortable way to fly..
Andrew, the Perth-London 787 service may not be landing in the Middle East, but will still be flying OVER it. WHY would Qantas fly to the cities’ you mentioned? There’s NO revenue in them for Qantas! Dead-end flights, as they’d be not returning as full aircraft. Airlines’ have got to fly routings that will generate big bucks, or they’ll go broke. The fact that an airliner can physically fly the distance is secondary. Don’t forget CX have a flight leaving ADL in the morning. With a 50 minute transit in HKG, you can arrive into LHR the same evening. A total of 22:35, I’m sure this will give QF a run for their money. The success of Routehappy and SeatGuru is proof positive that many ordinary people do care about seat attributes. The 787 in particular is memorabke because of all the hype it achieved and the airlines (stupidly) give it. This builds anticipation and then generates disappointment when people realise how cramped it is (especially with a floor mounted IFE box) in Y. A poll of my mates who’ve flown it at a recent catch up (mid 30 males, none overweight) had all of them saying they would rather fly an A380. Even if they don’t remember the aircraft they remember the airline. This move by QAN is a gift to Singapore, CX, the Chinese Carriers and all the mid East guys. Once Emirates starts flying out of their new airport and adds long range narrow bodies to the fleet (they can reach anywhere in Europe with an A321LR) it is game over for QAN’s Europe market share.